The elementary level Headway Video is an innovative English language teaching video that combines factual reports on topics of general interest with drama sequences that demonstrate situational language. The language syllabus is derived from the Headway Elementary coursebook. 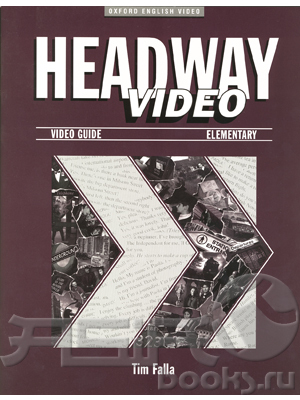 The video can be used as an additional component to the Headway Elementary course or as supplementary material alongside other coursebooks at the elementary level. The video is accompanied by an Activity Book for students and a Video Guide for teachers. The Activity Book is in full colour and illustrated throughout. Each unit is divided into three sections: the 'Before you watch' section aims to prepare students for the vocabulary used in the video; the 'While you watch' section starts with a global viewing task and then exploits the video scene by scene. The unit finishes with a 'Review' section to check comprehension. Finally, an 'After you watch' section offers optional activities in the form of role-plays, tasks and reading texts. There are also summaries of important situational language and a complete transcript of the video. The Video Guide provides teaching notes for each unit and help in using video in the classroom. It also gives cultural information, suggestions for further activities and answers to exercises. Last edited by arcadius; 12-28-2018 at 02:33 PM. nor able to donload any of the link.